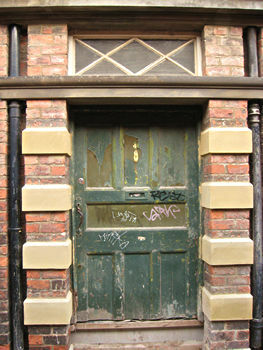 I’ve long admired this handsome door, and the narrow lane it’s on. 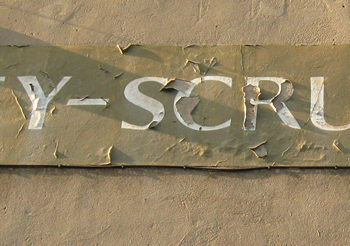 It was included in a ‘York Walk’ of 2004, when this site was young and my camera’s memory card was small, and all my photos were only 640 by 480 pixels – they look tiny now, and somewhat inadequate – and many of them were hopelessly wonky. Thankfully this door remained untouched, weathering nicely, until relatively recently, so I was able to go back again and get a slightly larger photo or two. 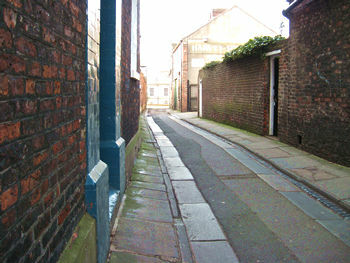 In 2004, I was charmed by this lane off Micklegate, and the remnants of the ‘Harvey-Scruton’ building. When I passed this way more recently, it was clear that the expected redevelopment had begun, and that it no longer had that ‘1950s’ feel. 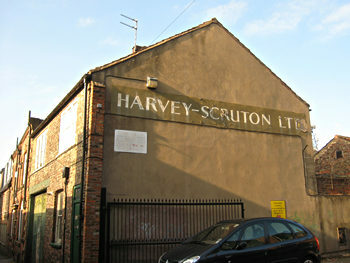 The reason this building catches the eye is of course because of its faded but still very prominent lettering, on the otherwise dull gable end, stating that it was once the premises of HARVEY-SCRUTON LTD.
Spot the difference … ? In July 2004 (above left) that parking area was open and ungated. Parking spaces are very valuable in this city, so it’s not surprising that by March 2011 (right) the space had been gated. 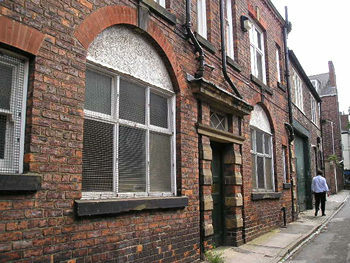 Lovely Barker Lane is pictured about a year ago, in March 2011, before redevelopment work began, looking from the Micklegate end towards Toft Green. It had a rather dreamy quietness to it, I thought. 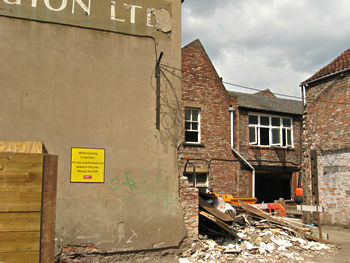 The photos above are from last summer, when demolition work appeared to have started at the back of the site. I do hope they’re keeping the frontage and that impressive doorway. 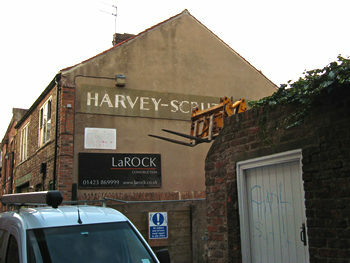 Despite stagnation and inaction elsewhere in York on some of the larger sites, the Toft Green/Tanner Row/Barker Lane area is now (spring 2012) like one big building site, all noisy, with vans parked everywhere and men in hard hats. At the end of this lane is the West Offices site, with a massive (and I mean massive) hotel building reaching to the sky alongside. The narrow Barker Lane, overshadowed by the huge hotel, was full of parked construction vehicles when I visited in late February 2012. Atmospheric photos are more difficult in these circumstances, so I only have this rather gloomy and unexciting one. 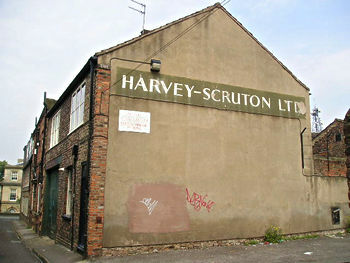 “Very spooky place at 6am on a misty morning was Barker Lane, and we never knew what we would find next in the carpark! … It was a family run manufacturing chemist. Inside, it was really old fashioned, but there was something about the place that just made it homely and happy. 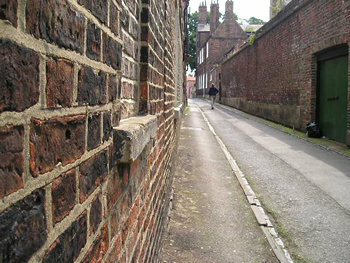 The inside walls were painted dark brown to waist height, thin black line, then cream on top, very old fashioned, but just looked right. At the back of the building, out on Tanner Row, there was still the marks on the wall where the hay racks used to be. 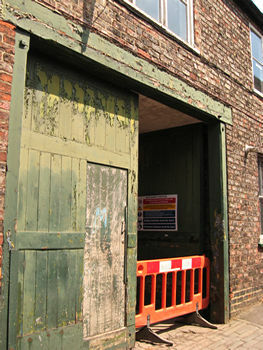 This dates back from when it used to be a coaching in and stables – a very cold flagged floor down there too.